Access to High Resolution images is granted on a case by case study. Granted only to working professionnals in the field of photography. If you would like to get access to High Resolution images, please fill out the information below and we will get back to you in the best delays possible. Departmental road number D243E3, parallel to the "European" highway (A16). Fences topped by barbed wire near the entrance to the Eurotunnel. Such fences were initially built in 2001 after the first influx of refugees in the nearby city of Sangatte, and have been tripled since. 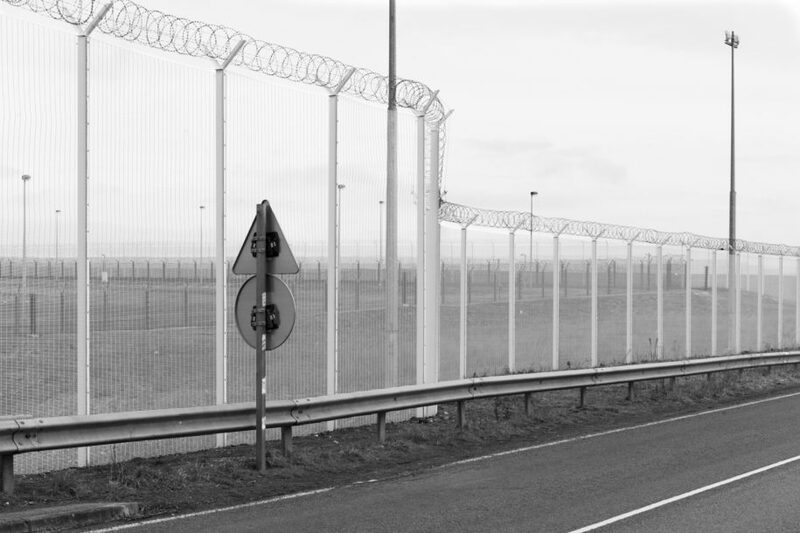 Today there is a total of 50km of Fences around the Eurotunnel entrance and the city of Calais. 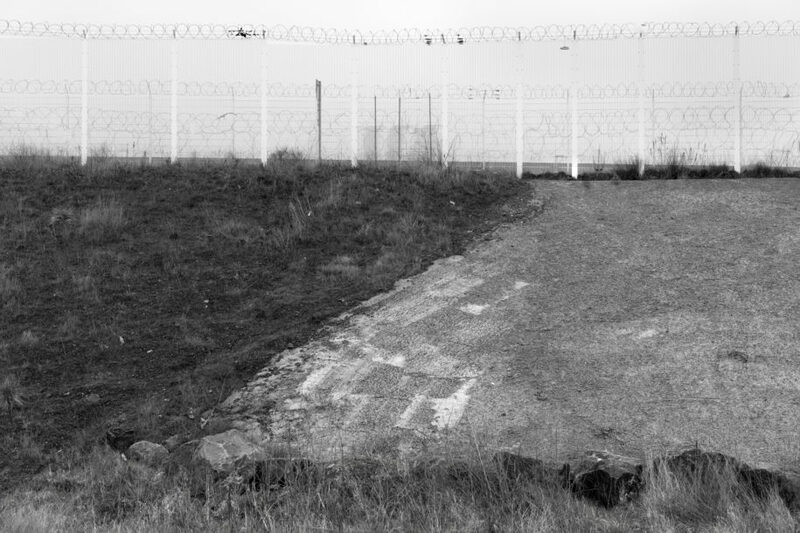 Fences topped by barbed wire near the entrance to the Eurotunnel. Such fences were initially built in 2001 after the first influx of refugees in the nearby city of Sangatte, and have been tripled since. 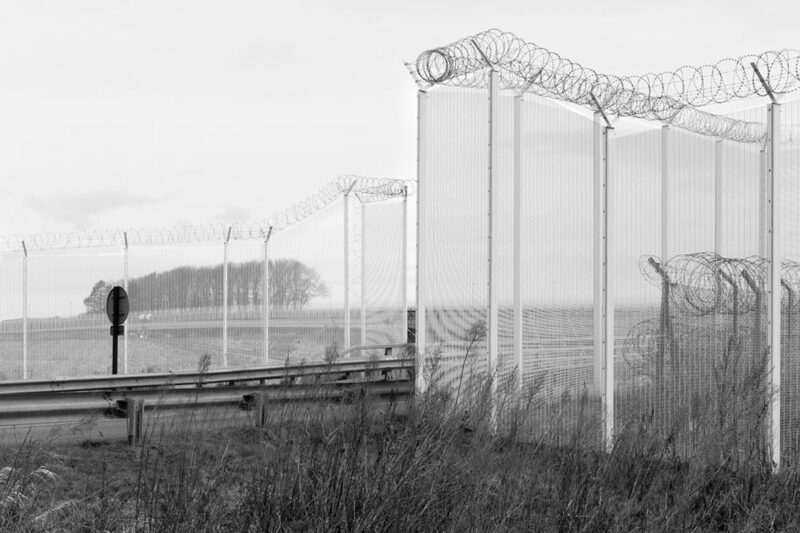 Today there is a total of 50km of Fences around the Eurotunnel entrance and the city of Calais. Holiday-Village (VVF, Village-Vacances Français) of Bleriot-Plage. Starting with the 1999 influx of refugees in and around the city of Sangatte, this holiday resort has been used during the winter period by companies of riot police forces (CRS), which has remained the case to this day. 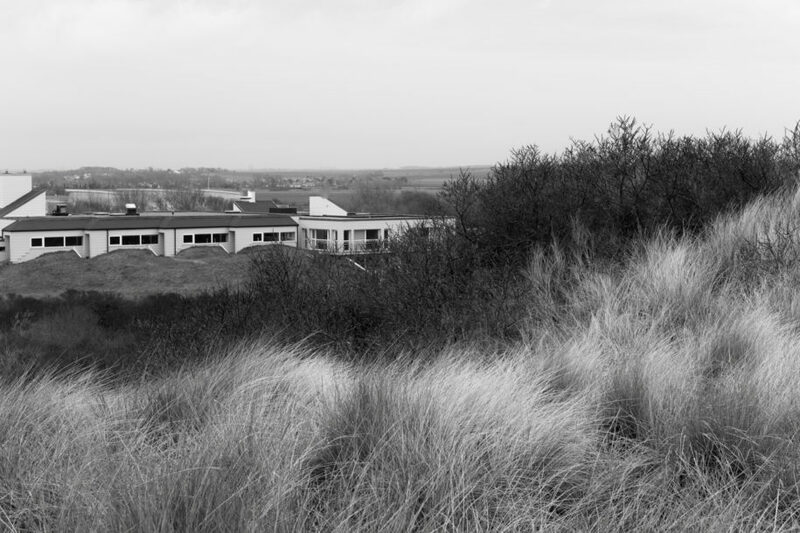 The constructions are built behind sand dunes into which Second World War bunkers from the "Atlantic Wall" can be found. 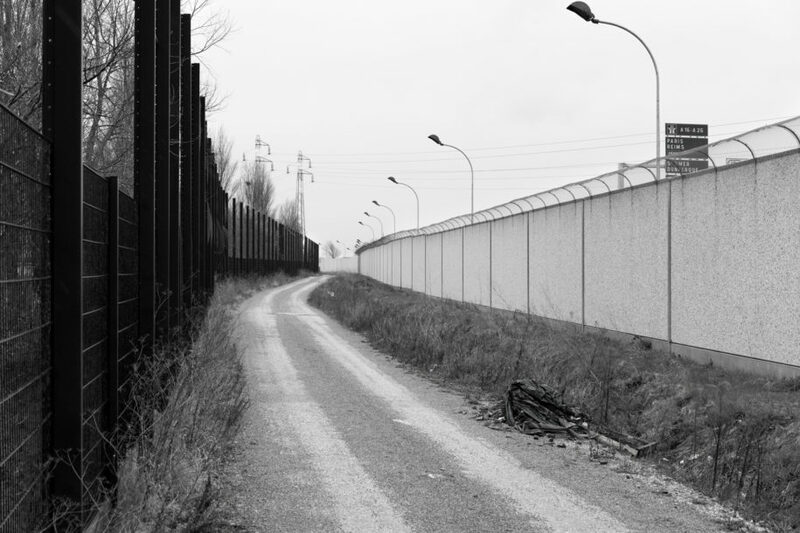 In October 2016 the "Great Jungle" of Calais was evacuated. 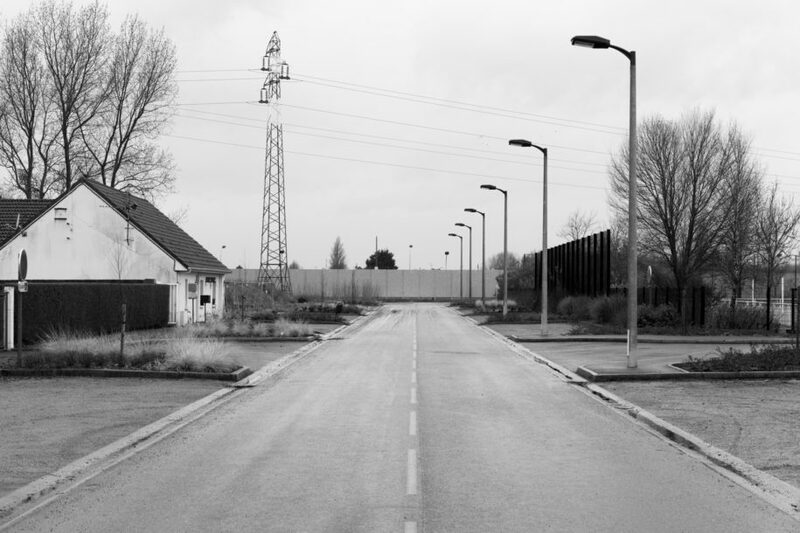 About 6 000 people were forcefully removed from the area and dispatched in housing facilities accross France (CAO, Centre d'Accueil et d'Orientation). The entire area was immediately bulldozed in order to prevent both vegetation and people to return. The double layer of fences topped by barded wire is the limit to the National Road RN216, which is the last leg leading to the port area of the city. In October 2016 the "Great Jungle" of Calais was evacuated. About 6 000 people were forcefully removed from the area and dispatched in housing facilities accross France (CAO, Centre d'Accueil et d'Orientation). The entire area was immediately bulldozed in order to prevent both vegetation and people to return. 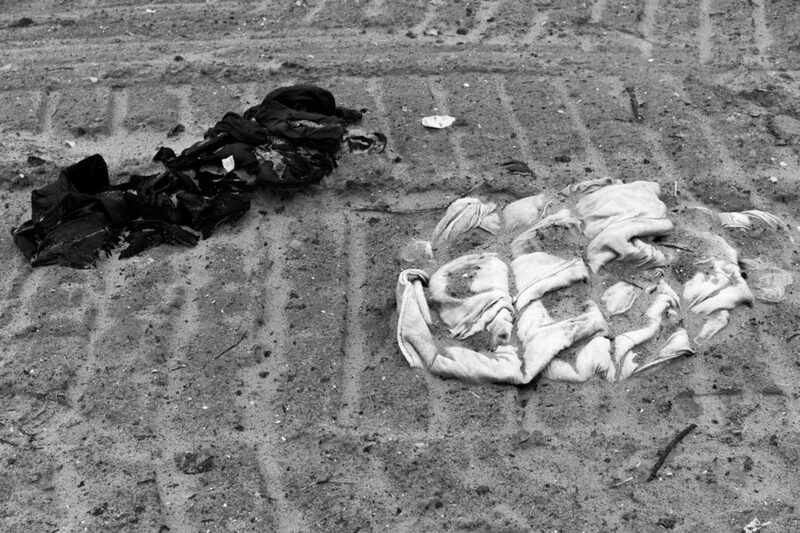 Here two blankets and a soap bottle are ground into the soil. Built between September and December of 2016 (at the time of the evacuation of the "Great Jungle"), this 1 km long and 4 meters high wall prevents access to National Road RN216. The city has filed a complain to ask for its removal on landscaping grounds, but on March 30th the Administrive Court of Lille ruled against the City, in favor of the conservation of the wall. It is pierced by holes near the ground to allow for wild animals to go across the obstacle. Grande rue du Petit Courgain, leading to the Wall of Calais. Left is the house of the concierge for the sports facility on the other side of the street. 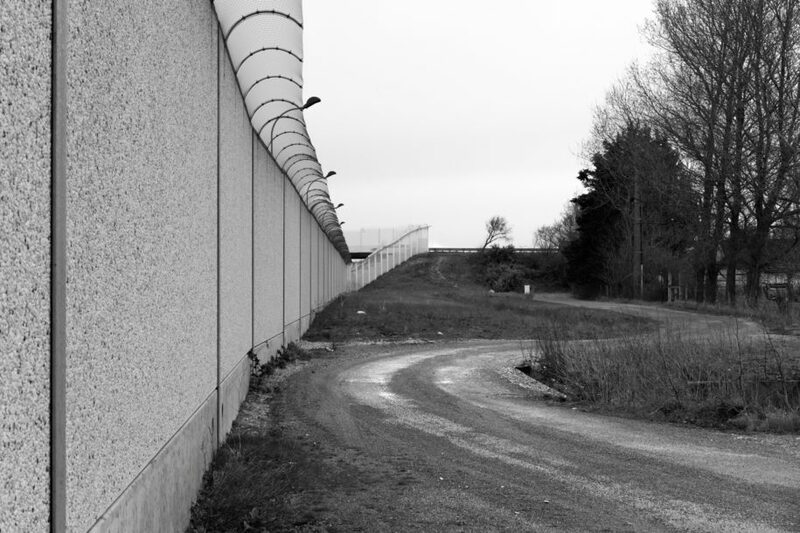 Built between September and December of 2016 (at the time of the evacuation of the "Great Jungle"), this 1 km long and 4 meters high wall prevents access to National Road RN216. The city has filed a complain to ask for its removal on landscaping grounds, but on March 30th the Administrive Court of Lille ruled against the City, in favor of the conservation of the wall. Central beach of Calais, with the 2:20pm P&O Ferry heading to Dover (30 minutes ride). This Ferry, the Pride of Burgundy, can hold up to 1420 passengers and 530 cars. Any driver caught transporting an illegal immigrant can be fined up to 2 000£. The fair for the ride accross the channel ranges from 68€ to 150€. Started after the first rise of refugee numbers from the Balkan region in the 1990s, the so called "migrant crisis" is becoming a sign of our times, and the city of Calais its headquarters in France. It is the closest continental point to the United Kingdom, only 42 km away, across the Channel. 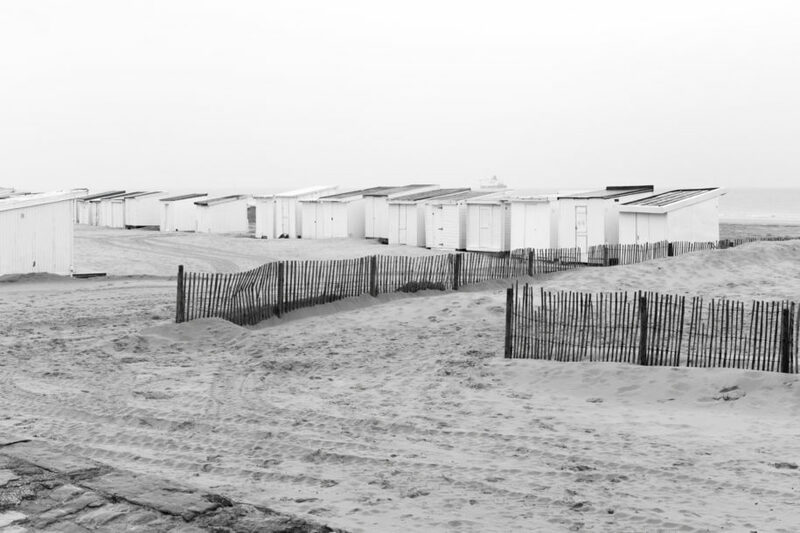 Between September 2014 and October 2016 a refugee camp developed in a wasteland east of the city of Calais, culminating with a 10 000 people population, all hoping to reach England. 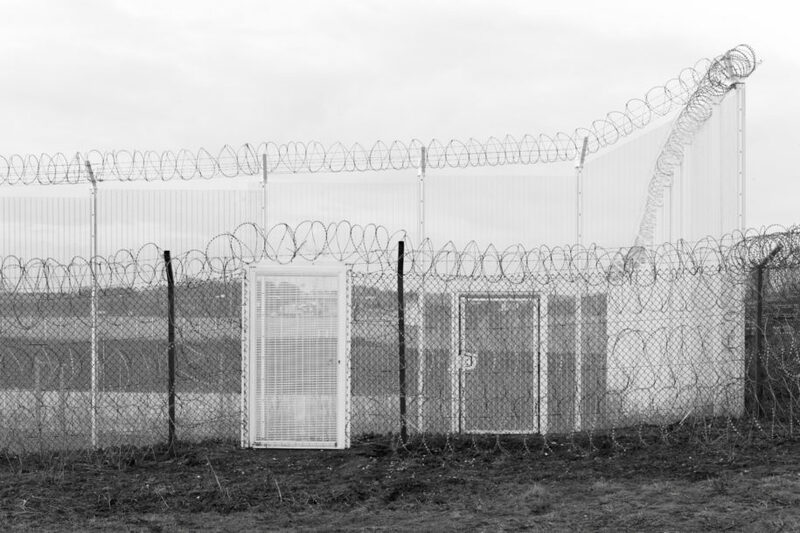 This refugee presence has lead to a militarization of the border, with now 50 kms of fences and barbed wire in place around the port and the entrance to the Eurotunnel. The "great jungle" of Calais was evacuated in October 2016. January 11th, 2018, prime minister of France, Edouard Philippe, presented his project for an "Asylum and Immigration" law, making access to the refugee status harder than ever before.